Parents today, need to think about keeping their kids healthy the natural way to combat various health problems. Here are some health tips for kids, which parents need to use to keep the child in good health. Healthy habits are always instilled in a child during the childhood days. The importance of a healthy diet is one of the first things parents should always strive to explain to their children. A healthy habit when infused in a child from the early years, only helps in the overall child development and turns him/ her into a responsible individual. Children need to be taught about the importance of healthy habits in a gentle manner. With time and care from your side, children are bound to understand the importance of healthy habits. Here is a basic compilation of tips related to kids’ health. With these health tips, kids can learn to look after themselves during their growing years. Teach your child the importance of a healthy routine. The day should always begin with a healthy breakfast. Help the child to understand why breakfast times are important for the day. You can make a chart of different breakfast recipes and tell him/ her the importance of many vital nutrients for one’s body. Fruits and green vegetables are important for a healthy diet. Your child should know why fruits score over packaged foods. You need to include fresh fruits during breakfast times or slip one in the lunchbox. Make it interesting by having fresh fruit juices or even fruit salads to break the monotony. Children are not aware about many things that are very important for their growth. As parents, you must ensure your child has plenty of water and fluids during the day. Fluids should include fresh juices. Make sure your child carries a bottle of fresh juices to school. Kids should know the importance of exercise at an early age itself. Teach kids few basic exercises that can be done at home. An exercise routine that incorporates walking or swimming can help children to manage these activities on a daily basis. As they grow up, these routines will naturally form a part of their life. Kids should also be aware of hygiene-related issues. Youngsters should learn things such as the need to wash hands before and after meals. For young kids, you can simply use a singsong routine to get them into the process. Children will then surely make this a part of their routine once they understand the importance of personal hygiene. Dental care should begin at an early age. 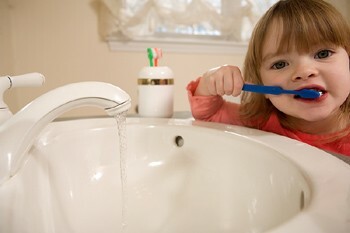 Brushing teeth twice daily is needed to keep teeth looking healthy and clean. You can promise to read a bedtime story for a kid that does not really enjoy a brushing routine. Make it seem enjoyable rather than making the child feel punished. As your child grows older, you can help your kid maintain a chart on foods to be avoided on a regular basis. It’s important the child knows that indulgence in foods high in sugar is fine once in a while. It should not be done on an everyday basis. Avoid being too stern if your kid wants to enjoy foods such as French fries and ice cream. Simply teach your child how to be smart and consume such foods only occasionally. Your child may require a daily dose of vitamins if the diet does not include the required amount. Make sure you check with your doctor about the vitamin intake to give the right amount of doses. There are many vitamin tablets packed in attractive containers. Generally, kids believe they eat candy instead of medicines due to the innovatively packed products that are available these days. There can also be alternative ways to include food items in the diet, which are a rich source of vitamins. Your doctor would be the best judge to decide upon the diet plan. Parents also need to make sure their children get the appropriate amount of sleep. The child needs a healthy balance of activities and play. Sometimes, children take a long time to fall asleep. You can read a bedtime story or simply speak to the child softly. This will help the child to fall asleep naturally. This health tip will help children to stay in good health and remain active during the day. Children need plenty of love and care right from their early years. Along with loads of love, these health tips will help to keep your kid fit and smiling throughout the day!